Are you looking for a fun traditional marble run toy for your children? A marble race track can be a great option, and in this review, we have compiled the very best marble run for kids available on the market. Marbles are a fun gift that will encourage kids to engage with non-digital entertainment and develop both mental and physical dexterity. A marble race is an appealing gift with a very reasonable cost, and there are many alternatives to choose from. 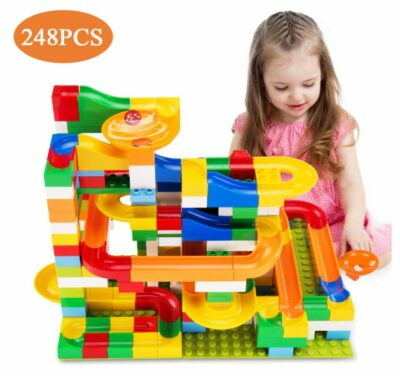 If you’re not quite up to date on the best marble run toy options, you will be pleased with the diverse selection of marble race tracks available online – ranging from the lego marble run to a wooden marble run and the increasingly popular mindware marble run. Read through the following sections you will have a clear idea of which type of toy best matches your requirements and specifications. 2.0.1 What are the Benefits of Playing With a Marble Run? 2.0.2 At What Age Will my Child Enjoy a Marble Run? So what exactly should you look for when trying to decide which is the best marble run toy for your kids? Since there is a wide range of available options from so many different brands, it’s easy to get confused once you start going through the different available designs. A simple way to avoid being overwhelmed with too many options is to simply start by setting your goals before you start looking through the listings. 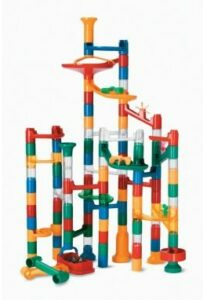 Depending on the age and personality of your children, you may want to lock in on simpler models that are easy and quick to start playing with… or instead, you may want to find one of the more complex marble tracks out there – some of which feel like intricate puzzles whose construction is an experience in itself. 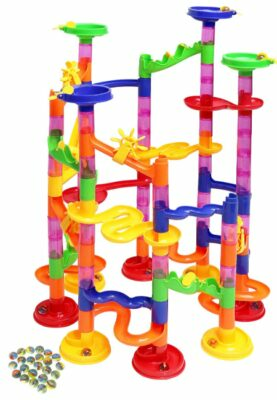 You may want to find a more traditional version of this toy which includes just one or a few different configurations, or you may want to check the latest models that provide increasingly complex marble runs. You will also notice there are brands catering to specific age groups and proficiency levels, so you may want to lock in on those best suited for your kids. We have compiled all the most popular and best-selling marble race tracks in the following sections, hoping this will provide a convenient reference for anyone who wishes to make an informed decision without spending too much time doing research. If you want an intricate run with multiple assembly options and a diverse mix of pieces and bases, the Marble Genius Super Set is one of your best options. This package includes no less than 100 translucent pieces made of solid quality plastic, including 19 different pieces that can be combined in diverse designs that will provide many exciting race tracks for the 15 included glass marbles. 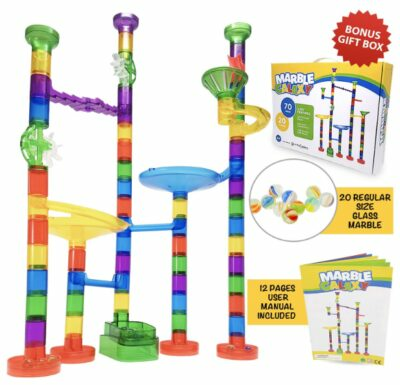 This kit is easy and fun to put together and includes an instruction app showcasing how to create 9 different marble race tracks. It’s also compatible with other sets from the same supplier, making for an awesome expansion potential that will keep your kids interested and engaged for a long time. Here’s another leading option for parents who want to challenge their kids with an intricate and complex marble race track. This 150 Piece Marble Set from Joyin includes a hundred action parts made of translucent plastic, along with fifty marbles of regular size. Using these colorful parts, your children will spend countless hours exploring the various possible race tracks and improving their motor reflexes and logical thinking while enjoying an entertaining traditional toy. This set complies fully with US safety standards, and the plastic materials used in its production are entirely non-toxic; all parts fit one another perfectly and make for a stable and reliable run. Comprising a total of 70 transparent building blocks for better watching the 20 included colorful glass marbles, this is a set of medium complexity that can be assembled in at least four different ways with increasing complexity levels. The Marble Galaxy Maze includes a user manual in color with assembly instructions and many ideas for marble racing games. 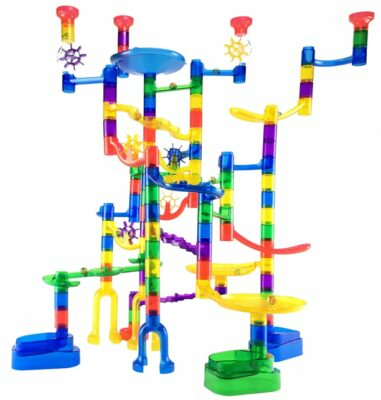 Your children will love exploring the many possibilities available in this marble run toy, and while doing so they will naturally develop their special awareness and engineering skills. This kit is made of non-toxic materials and features smooth edges on all parts to ensure safe handling. Do you want a superset that will provide the most combinations and pique the creativity and craftiness of your children? In that case, the MagicJourney Giant Run could be a top option, with its 176 track pieces made of colorful plastic, plus 24 translucent connecting tubes (including slides, wheels, windmills, ladder glides, U-turns and more) along with a set of 30 marbles in vivid assorted colors. This Jumbo set can be combined in four different modes ranging from Easy to Hardest, and by swapping the various pieces around your children will effectively enjoy hundreds of possible combinations – meaning they won’t be bored with this toy anytime soon. When you want a marble toy that will last for many years unscathed you will naturally turn to Mindware, since this brand is known to provide some of the most robust toys in existence. 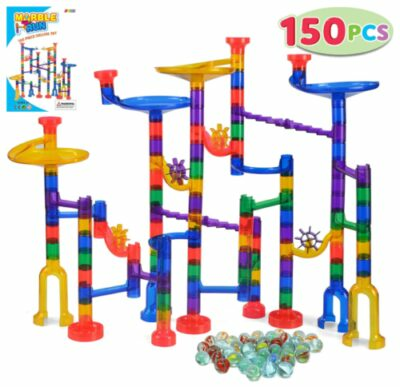 All 103 parts in this set are made of high-quality plastic with extreme durability, and the 20 included marbles are also very solid looking and dense, in order to provide maximum sliding speed and set the stage for the most thrilling marble races you’ve ever seen. The pieces in this set are a bit larger than usual, making them particularly easy to assemble and suitable for all children over 4 years old. When your children are accomplished marble experts and you want to provide them with the latest and most innovative options, the Ravensburger GraviTrax is a natural choice. 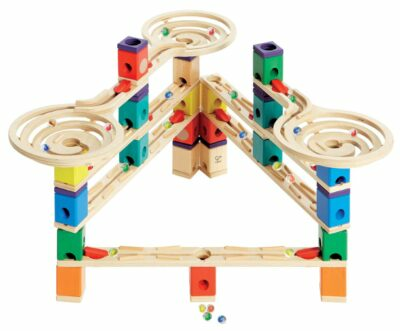 This is a very unique marble track with unusually shaped parts and some cool features you won’t see anywhere else, including some crafty magnetic pieces as well as the more traditional gravity chutes and kinetic ladders. The Gravitrax is an award-winning design that is raising the bar in the world of marble race tracks, and many people are claiming this is currently the very best marble run for kids; this toy is a little more complex than traditional options, and it’s recommended for children aged 8 and higher. If your priority is finding a marble track with really big parts that are suitable for younger children (aged 3 and over), this Marble Puzzle is a great option – for a frame of reference, keep in mind the four included marbles are roughly the size of golf balls. This set is made of sturdy, smooth, non-toxic plastic and includes a total of 97 extra large pieces in diverse colors that can be combined in three different race tracks. It’s a perfect choice for anyone seeking an entry level run that can be enjoyed safely by younger kids, and still provides a fun challenge and extensive entertainment. Here’s an extremely colorful and easy to assemble marble race toy that could be the ideal choice for the most budget-conscious parents. The Kiddie Play run is aimed at children aged 4 to 8 years old and includes a total of 30 glass marbles (about half-inch in diameter) and 75 parts made of translucent plastic, including a diverse assortment of connections that can be swapped around to produce a surprisingly wide range of combinations. This creativity-fostering set is very easy to assemble and covers a diameter of around 14” and measures nearly 18” of height. If you’re looking to invest in one of the finest, most elaborate and highly unusual tracks out there, you will likely be interested in this wooden marble run from Hape – one that stands a chance of enduring through multiple generations of your family. This award-winning toy aims to redefine the concept of a marble race track, and is very different from typical models, notably because it features no plastic parts whatsoever. Featuring no less than seven different possible assemblies and seven different colored blocks (each boasting a different function), this wooden toy will engage children and adults alike. This is another marble track that aims to redefine the traditional formulas and introduce some interesting novelties. 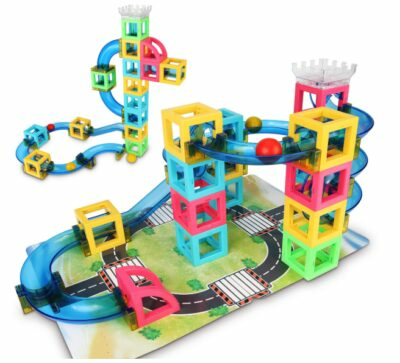 Since the building blocks included in this marble race tracks are all magnetic, this toy also doubles as a gravity maze game that can be assembled in unusual places with unexpected orientations. All the parts are made of eco-friendly materials which are notably sturdy and shatterproof, and can be combined in highly creative shapes that go beyond the concept of a mere race track. This set is recommended for children aged six to twelve years old; they will love to experiment and create their own unique designs using the included parts. Here’s another natural choice for anyone who wants a wooden toy that looks and feels different from the more traditional plastic models. Even though this set only includes a total of fifty hollow wooded pieces plus ten marbles, its unique conception makes for a surprisingly diverse and versatile range of track designs. There are many types of blocks included, featuring slanting holes and diverse channels. This is a highly versatile set that is recommendable for children of at least five years old, and it almost doubles as a puzzle since it can be combined in so many different ways. This wooden marble track will impress not only those parents who prefer non-plastic materials but also those who want a very unique marble race track. 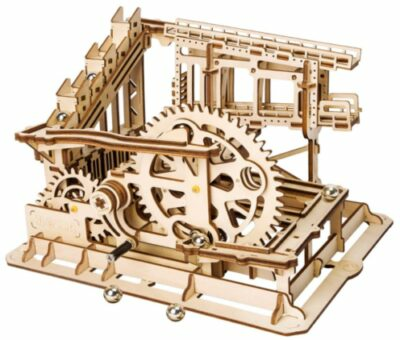 This assembly set feels more like a 3d puzzle than a mere marble race, with its precision-engineered parts mare of plywood and its unique design that is somewhat reminiscent of a roller coaster – including an automatic shunting fork. The challenge of assembling this DIY will be refreshing and interesting, and this is a marble track that even a grown person may enjoy playing with on their own. This building set is meant for younger children, since it’s very easy to assemble and all parts are larger than average for this kind of toy. It includes a total of 248 pieces that also double as building blocks, which can either be used for creating different tracks that feel like a LEGO marble run, as well as to create many kinds of shapes and animals. 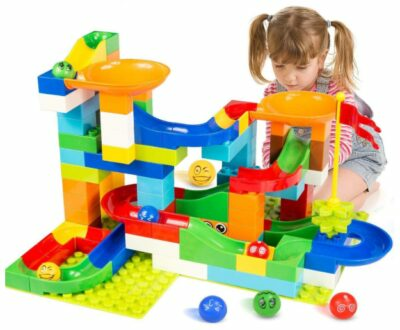 If you like the idea of offering your kids a massive set of building blocks that double as a marble track, you will likely want to get this set. 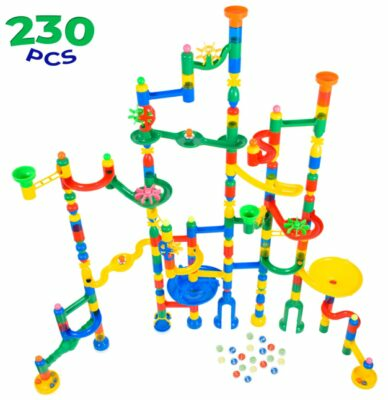 As you can see by reading through the sections above, we have included a diverse selection of marble race tracks, hoping to provide a good alternative for all kinds of kids of different proficiency and creativity levels. 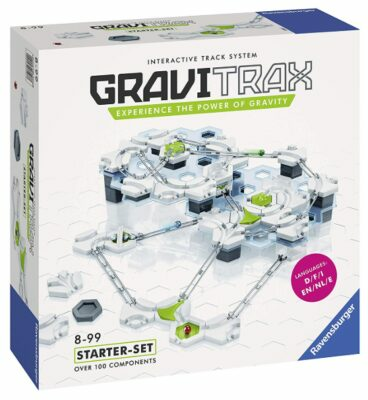 While choosing the right set will depend on your personal preference and educational goals, we feel the overall best buy out of all these options is the Ravensburger GraviTrax – because it bridges the gap between tradition and innovation, has an intermediate price range and provides an interesting assembly challenge that is suitable for children but is challenging enough to also keep teenagers or adults interested. What are the Benefits of Playing With a Marble Run? Marble race tracks are great toys because they are relatively inexpensive and provide great replay value. They are a great alternative to computing devices and will keep young children engaged while stimulating their creativity and helping them develop cognitive functions. These toys will also help kids develop spatial reasoning, physical dexterity, and hand-eye coordination; these toys are also known to boost problem-solving skills, contribute to developing shape/color recognition and even to promote a sense of craftsmanship and focus. At What Age Will my Child Enjoy a Marble Run? Even though most typical marble toys are meant for children aged four to eight, there are so many versions to choose from that you can easily find a suitable option for children of all ages. There are many different designs meant for children as young as three years old, and some models are interesting and challenging enough to hold the attention of a grown-up person. 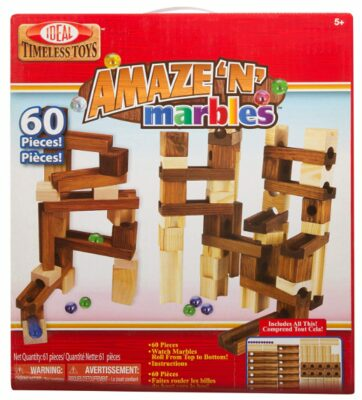 If you’re looking to gift your kids with a marble maze toy that is right for their age and proficiency levels, you will easily find the right option by checking the alternatives featured above.